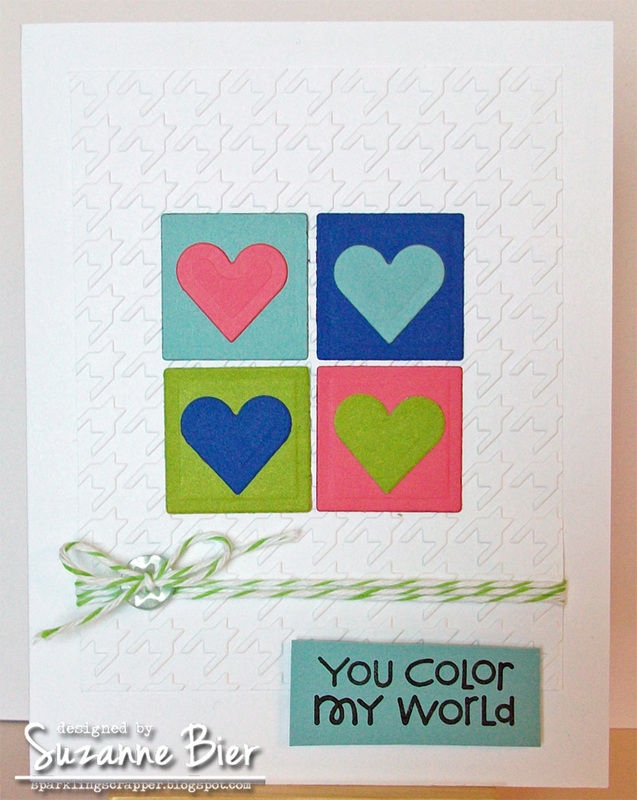 Supplies: embossing folder (Lifestyle Crafts), sentiment stamp (Paper Smooches), heart and square dies (Spellbinders), button, twine (Whisker Graphics), colored cardstock (Stampin’ Up – Lucky Limeade, Regal Rose, Brilliant Blue, Baja Breeze), white cardstock (Papertrey Ink). Before I go, I’d like to let you know that this is my last week with the colourQ Royal Court. 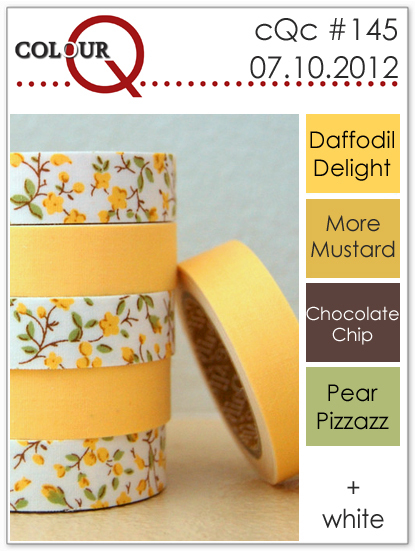 The colourQ is one of the first challenges I played along with when I started making cards…it has been phenomenal to have been part of the team for almost 1 1/2 years! My husband is in the process of departing the U.S. military after 13 years, and we’re transitioning back to civilian life (with one last move on the way near the end of this year). I’m so honored and humbled to have designed with all of the fabulous ladies on the Royal Court…they always floor me with their creativity! Special thanks to Arielle for giving me a chance to join the Royal Court…you are a ROCKSTAR! I will still be making cards, of course, but my focus will be shifting to a few new crafty opportunities and preparing for our upcoming move. This was, without a doubt, the hardest crafting-related decision I’ve had to make. And as always, thank YOU for stopping by! I hope I’ll still inspire you with my creations each week! Happy Tuesday! 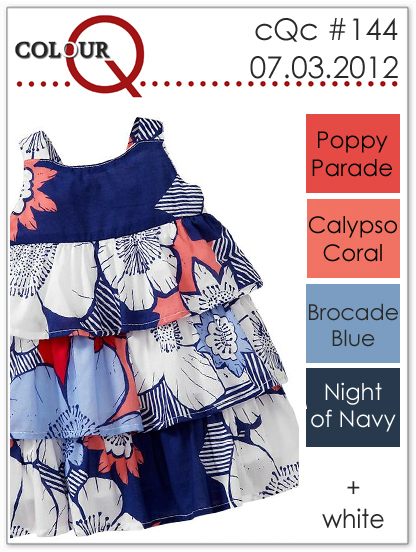 It’s time for a new colourQ challenge! Here’s my card … I actually colored the image this week instead of paper piecing…I drew and cut out the tie, though…it’s not part of the original image. 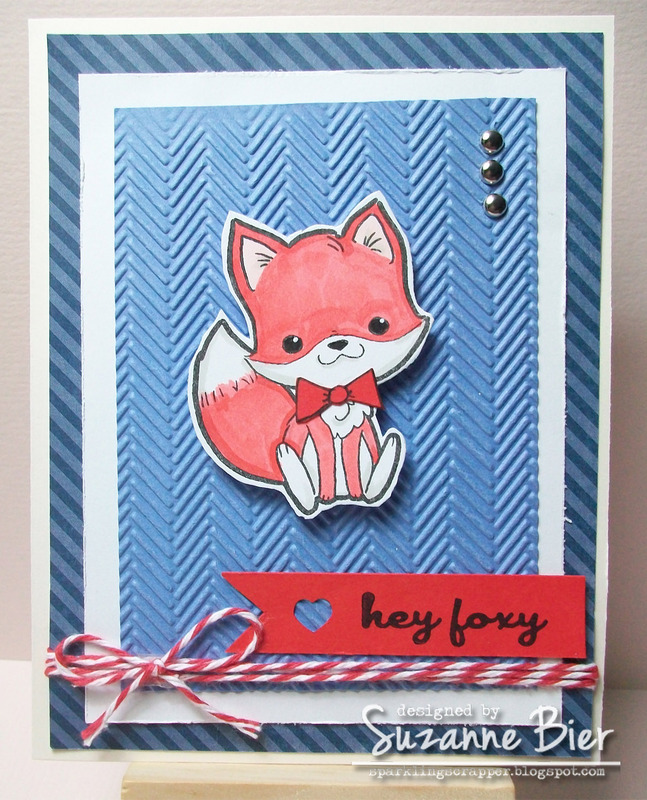 Supplies: card base, cardstock (SU Poppy Parade, SU Brocade blue, Papertrey white), patterned paper (Echo Park Dots & Stripes), twine (Trendy Twine), image and sentiment stamps (Some Odd Girl), mini heart punch, mini silver brads, Copic markers (R22 – fur, R24 – fur shading, R000 – ear fur, W1 – shadows). 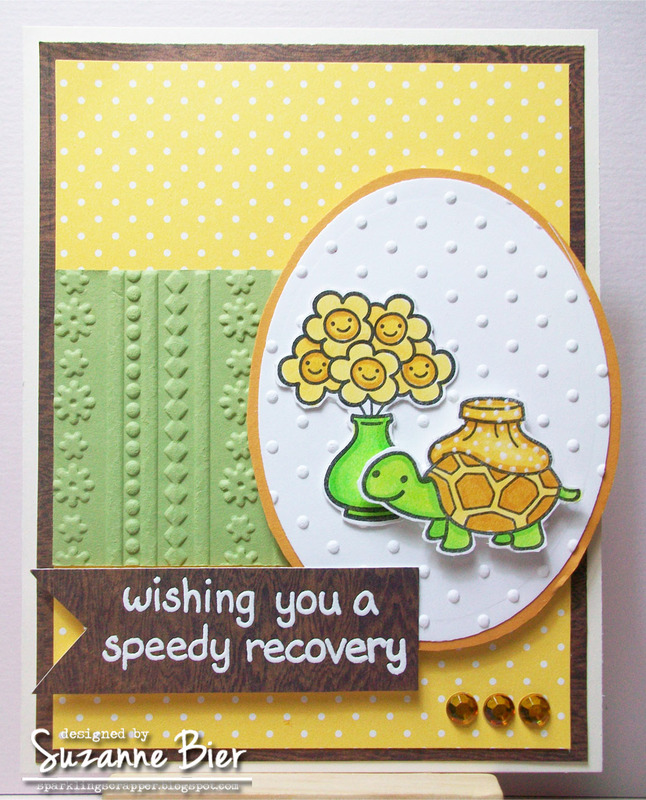 embossing folder (Cuttlebug). ink (Brilliance Graphite Black). If you’re in the United States, I hope you have a safe and happy July 4th celebration! Happy Tuesday! It’s time for a new colourQ challenge! Thanks to everyone who played along with our last challenge…you always make it so difficult for us to pick our favorites! P.S. 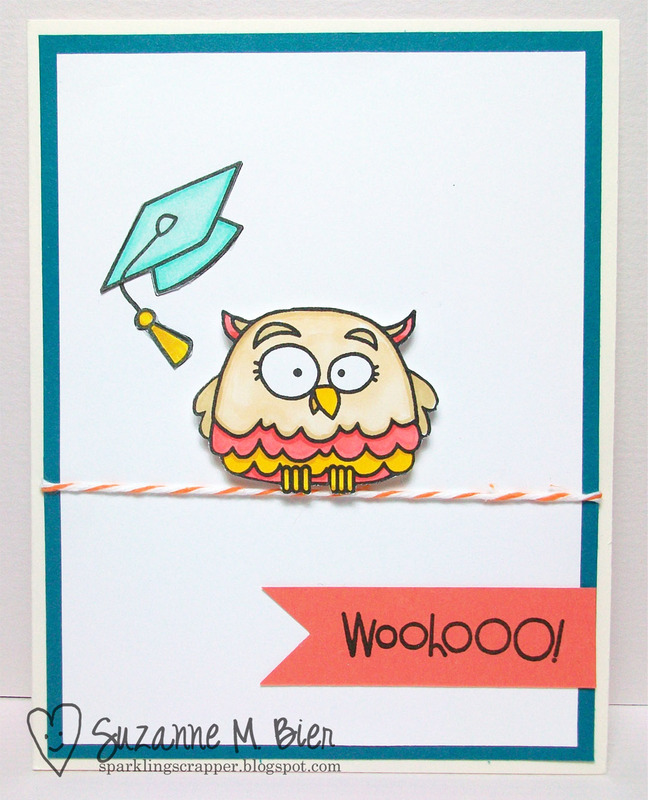 There’s still time to play along in Your Next Stamp’s “Summer Time” challenge! One lucky winner will receive $10 to spend in Your Next Stamp’s store! You can find the details on the YNS blog or at our Splitcoast forum! Our next challenge goes live on Thursday, so make sure to get your entry in before then! 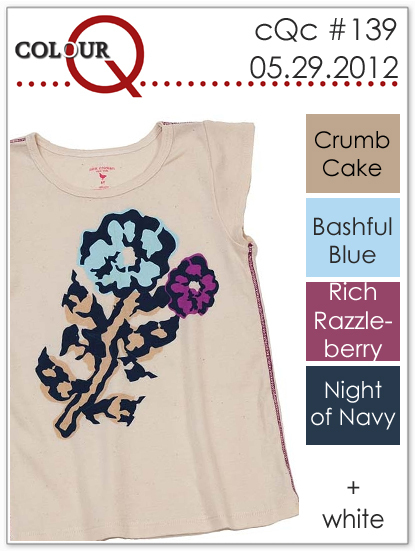 And, there’s also a sale going on right now at Your Next Stamp (sale items included)! 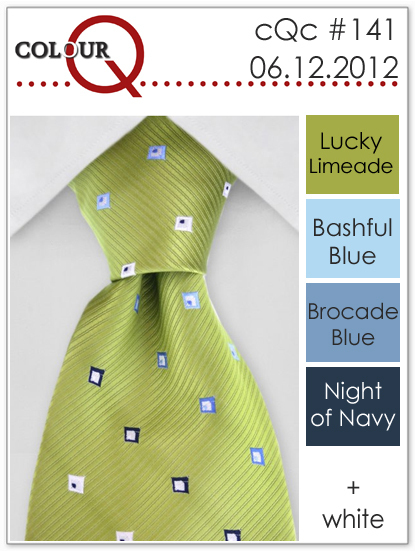 Supplies: ink (Night of Navy, Brocade Blue, Lucky Limeade – Stampin’ UP! 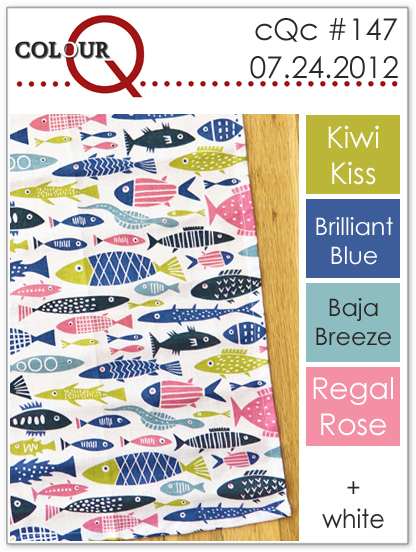 ), cardstock (Lucky Limeade, Bashful Blue, Night of Navy – Stampin’ UP! ), cameo image stamp/oval (Maya Road), sentiment stamp (DeNami Designs), chevron background stamp (Hero Arts), screw brads (Karen Foster Designs), card base. 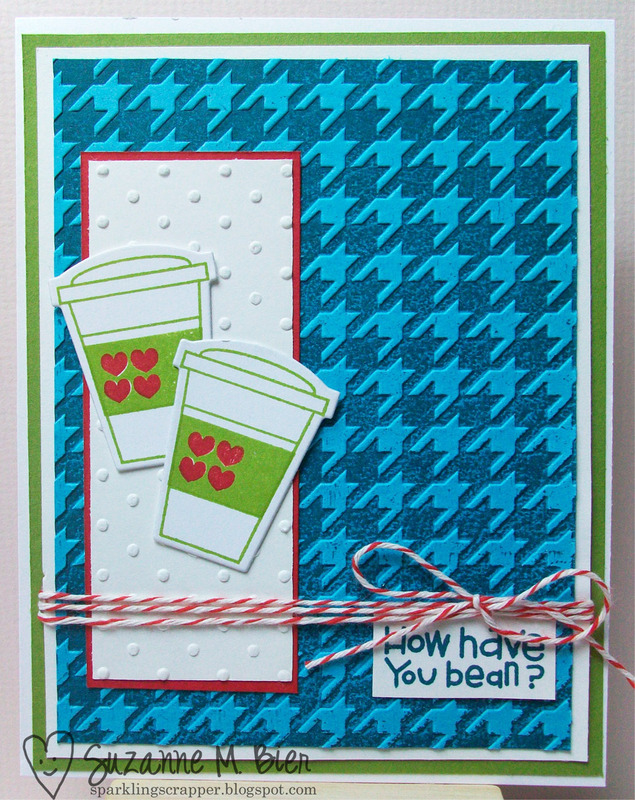 Supplies: cardstock (Real Red, Tempting Turqoise, Lucky Limeade – Stampin’ UP! 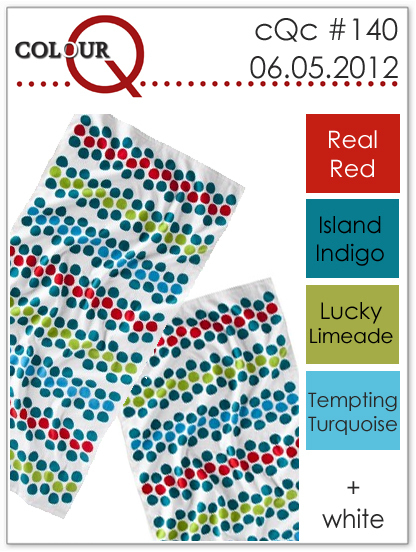 ), ink (Real Red, Island Indigo, Lucky Limeade – Stampin’ UP! ), embossing folders (houndstooth – Lifestyle Crafts; dots – Cuttlebug), image stamps and die (Papertrey ink), sentiment stamp (Paper Smooches), baker’s twine. It’s not that hard to do…basically you will be inking the inside of one of your embossing folders and placing the pre-cut card stock inside. Then, when you run it through your die-cut machine, you get part of the image inked and you’ll have custom-embossed patterned paper. I discovered a few things: it’s easier to cut the card stock before you emboss it. It may take a few tries as you figure out which side you prefer to have inked vs. embossed. I used Stampin’ Up Classic ink, and it cleans up easily from the inside of your folder with a wet wipe. Depending on the card stock you use (I used SU card stock as well), you might get more of a distressed look as the ink will not soak in some spots and will be darker in other places. 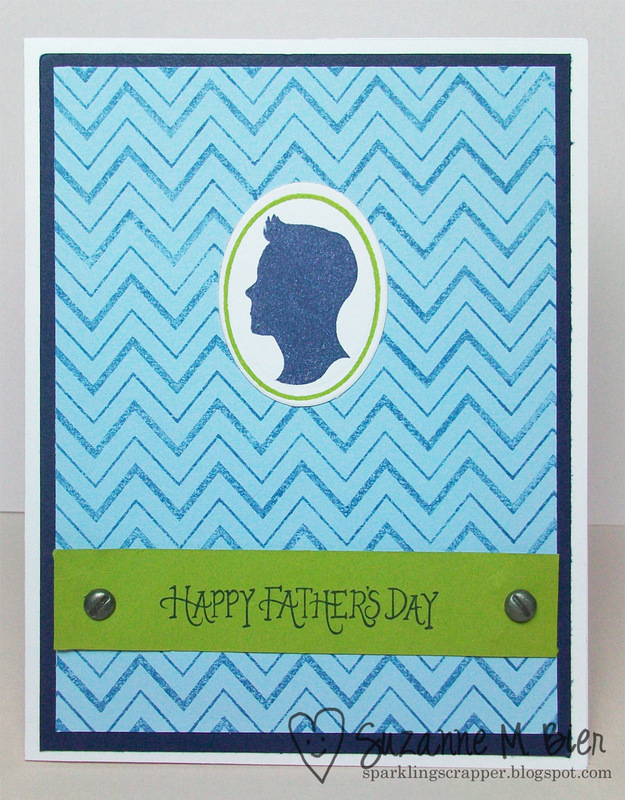 For this card, it’s probably more noticeable because I used the Island Indigo ink on the turquoise card stock. Thanks to everyone who joined us for last week’s challenge! 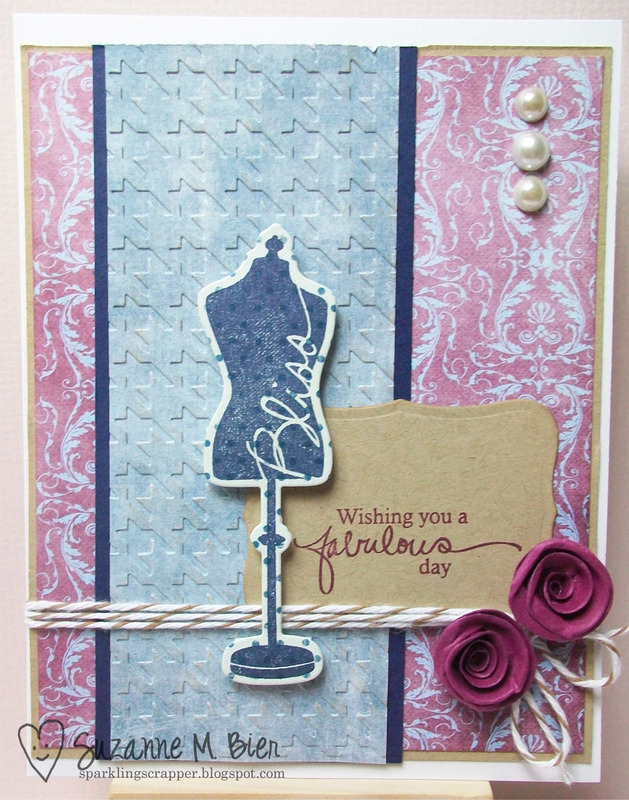 I noticed that a few people were inspired by my dress form stamp/die set from last week’s card…it’s very flattering to know that my creations inspired you in some way! I’m in the process of opening my online card store. I hope to get the kinks worked out so that I can open the shop this weekend! I’ll be sure to post the info here when it goes live! 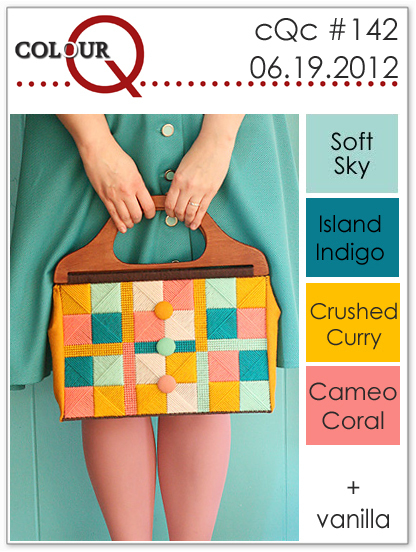 If it’s Tuesday, then it must be time for a new colourQ challenge! Thanks to all who played along with us last week! We always love seeing your creations! Hope you had a wonderful Memorial Day holiday weekend (if you’re in the U.S.)…it’s supposed to mean that summer’s on the way! As long as that means less rain for us in the Pacific Northwest, I’m pretty happy about that! Supplies: stamp set and die (Signature Series – Dress Form Mini Stamp Set & Die – Papertrey Ink), ink (Rich Razzleberry, Night of Navy – Stampin’ Up), cardstock (Stampin’ Up), embossing folder (Classic – Lifestyle Crafts), twine (Divine Twine), patterned paper (A Beautiful Life – My Mind’s Eye), foam tape, rolled flower die (Memory Box), adhesive pearls (Prima e-Line).